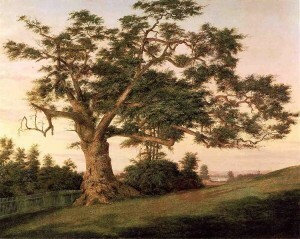 The Charter Oak by Charles de Wolf Brownell. Courtesy of the Wadsworth Atheneum. Connecticut, of course, has a long history of budget shenanigans. The gimmickry in Hartford, ironically enough, was partially inspired by the constraints of the 28th Amendment – passed in the wake of the new income tax – that requires a balanced budget and caps spending. The framers of the amendment, although well-intentioned, failed to anticipate one important factor: the state sets its own accounting rules. Consider an analogy. You commit to stop spending more than you earn each month and start a personal budget. One month you decide you’d like a Las Vegas vacation you can’t afford. To keep your books in balance, you wait until the first day of the next month to pay rent to your landlord. The state has essentially been doing just that for two decades: pulling revenue into the current year and pushing expenses into the next on an as-needed basis. Whenever the books didn’t balance, we recalibrated the scale instead of addressing the problem. The change to Generally Accepted Accounting Principles is often discussed in Hartford because it carries with it the aura of good government. However, the problem is this is just another shell game. We are in the process of planning to begin to use it, which only counts as progress in the halls of government. To be clear the state has kept a second set of books using GAAP for years. It is still doing that. That’s fine, but it has no real impact. GAAP won’t impact the Connecticut until politicians are constrained by it. In other words our state budget should use GAAP (it doesn’t) and for constitutional purposes our budget should only be in balance if it is balanced according to GAAP (it’s not and won’t be until we pay off our billion-dollar balance). Politicians make the rules, making it hard for taxpayers to constrain their spending. Legislators can change the rules when they are inconvenient. In other words, if one rule requires the budget to be in balance every year, they change the meaning of year to make the requirement fit the reality. With Gov. Dannel Malloy committed to no tax increases this year (since last year he instituted the largest in Connecticut’s history), be on the lookout for a return to the smoke and mirrors of deficit accounting. Although the numbers vary, most prognosticators in Hartford predict at least a small deficit at the end of the fiscal year. Hence the scramble for a fix. Malloy’s budget chief recently asked agency heads to make cuts to keep the budget in the black. But with the pressure on, someone in the legislature might want to get creative. When it comes to government accounting, creativity isn’t commendable. Last week the Wall Street Journal highlighted uses of deficit gimmicks in Europe. According to the Journal, pressure from European Union rules inspired a number of games that turned deficits into something that walked and talked like a deficit, but wasn’t called one. In Europe government’s have been absorbing private pensions because the assets balance the current budget even though these transfers throw future budgets further out of whack. Other tricks, such as leases and securitization of revenue, are starting to get scrutiny from accounting rulemakers. Let’s hope Connecticut doesn’t rejoin this crowd. Raising Hale is bringing back It could happen here, a feature that has been dormant for a while. Each Friday, Raising Hale will highlight one crazy thing from the latest headlines that could happen in Connecticut. To suggest a topic, contact Zach.